DATES: You will arrive on Saturday July 6 and leave after breakfast on Saturday July 13. Check-in time is between 3:00 and 5:30pm on Saturday July 6. EVERYONE must be checked in before 5:30 on Saturday. FEES: The TOTAL price for 7 days is $850. The price includes workshop fees, one manuscript critique, programs, parties, room (double occupancy), and meals. 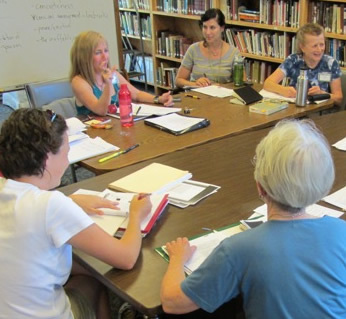 ADMISSION REQUIREMENTS: Published, unpublished and talented beginning writers are welcome at Wildacres Writing Workshop, but you must be a serious writer to attend. We require a one page sample of your writing (not returnable) submitted with your application. Alumni can forego the sample. ADMISSION REQUIREMENT EXCEPTIONS: If you have a friend or spouse who would like to accompany you, they are welcome. (The fee for this person is also $850.) Only one person in the room is required to take part in the workshop. Wildacres Retreat is a wonderful place for a relaxing vacation. These are "working" workshops where your manuscript is critiqued and given the attention it deserves. Class sizes are ten or less and leadership is at the Master Class level. You may only enroll in one workshop, but you may audit others. You are in class approximately 2 hours a day. You MUST submit a manuscript and you MUST read and critique the manuscripts submitted by your classmates. FACULTY PREFERENCES: We will try to honor your faculty request, but for people coming to Wildacres for the first time, we usually can tell where you will be the happiest. MANUSCRIPTS: Manuscript limits are: Poetry: 6 poems; Flash Fiction: 3 to 4 stories, depending on length, not to exceed a total of 15 pages with a 4,500 word limit; Short Story, Novel, Creative Nonfiction: 15 pages with a 4,500 word limit (word count must appear on the front page). Do NOT send more pages than stipulated and do NOT revise the manuscript once sent. Most of the classes will exchange manuscripts electronically before June 1st. Do NOT email or fax your manuscript until directed by your instructor. Each class will be notified by the instructor about how manuscripts will be handled. You will receive this information long before June 1st, probably in early May. We advise that you bring a few extra manuscript copies with you to the workshop for auditors. SCHEDULE: Every class will have a day off on a staggered schedule. This will allow you to audit classes that are in your same time frame or go sightseeing. There are activities every night. Meals are at 8:00, 12:30 & 6:00. Your schedule will be in your packet when you arrive. DEPOSITS: Deposits are due IN OUR OFFICE by MAY 20th. Writing samples MUST also be sent by May 20th unless you are an alumni. If you wish to apply after May 20th, please call to see if a space is open: (336) 255-8210. BALANCES: Your balance is due June 1. No exceptions. REFUNDS: A $100 cancellation fee is charged through April 1st. From April 1st to June 7th there is a $175 cancellation fee. There will be no refunds after June 7th unless we can refill your spot. If you are not accepted, your entire deposit will be returned. SCHOLARSHIPS: Scholarships are available. Many of our students request Grass Roots Grants from their local Arts Council or a local college and are seldom denied. WE FILL UP EARLY! Please remember that Wildacres fills up quickly. 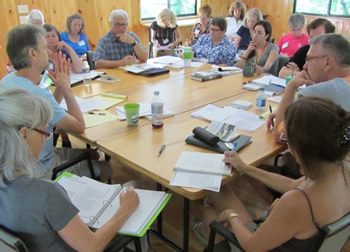 For the Writers Workshop Program we can sleep 90 attendees plus faculty & working staff. We always have a waiting list. 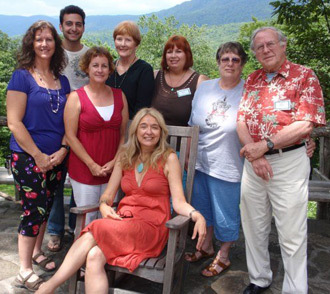 BONUS RETREAT WEEK AVAILABLE FOR WRITERS: Any writer who attends the July 6 - 13 workshop may attend the prior week (June 30 - July 6) as well for an additional fee. You may use the time as you wish. The total cost for the two weeks combined is $1,300.